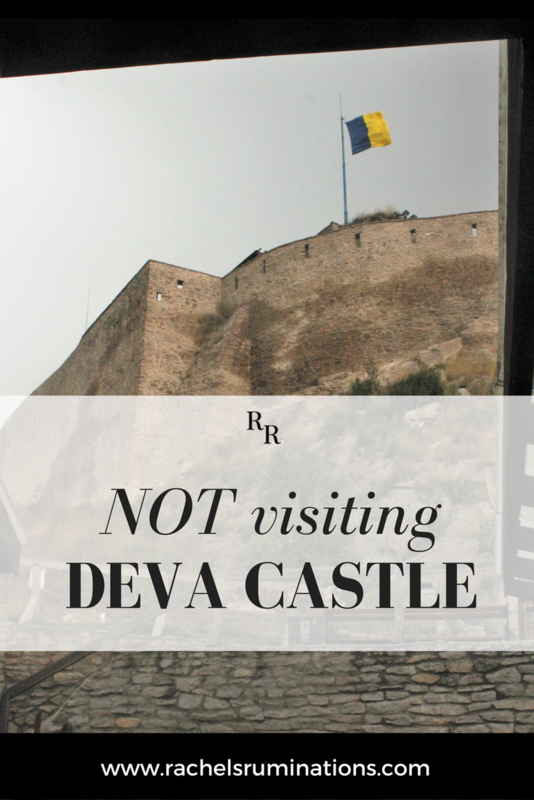 We weren’t even planning to go to Deva Castle. My husband and I were just driving along, minding our own business, on a road trip in the western Carpathian mountains of Romania. The GPS was guiding us from Timişoara (beautiful buildings, much in need of renovation) to Alba Iulia (18th century fortress with seven bastions), but we also had a printed map. I noticed that we’d be passing Deva, which was marked with the symbol for castle. A quick search of Wikipedia (I love that roaming costs the same all over Europe now!) told us that Deva is home to the ruins of a 13th century fortress perched dramatically on the top of a hill. 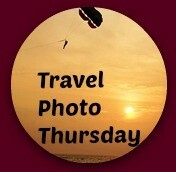 It’s reachable by walking path or cable car. Thinking we could use a break and a bit of exercise, we decided to visit it, a decision confirmed when we saw the dramatic view of a hill, topped with the stone walls of Deva Castle. It was overcast but not raining when we arrived, and we got in line for the cable car, figuring we’d decide later whether to walk down afterwards or ride the cable car. 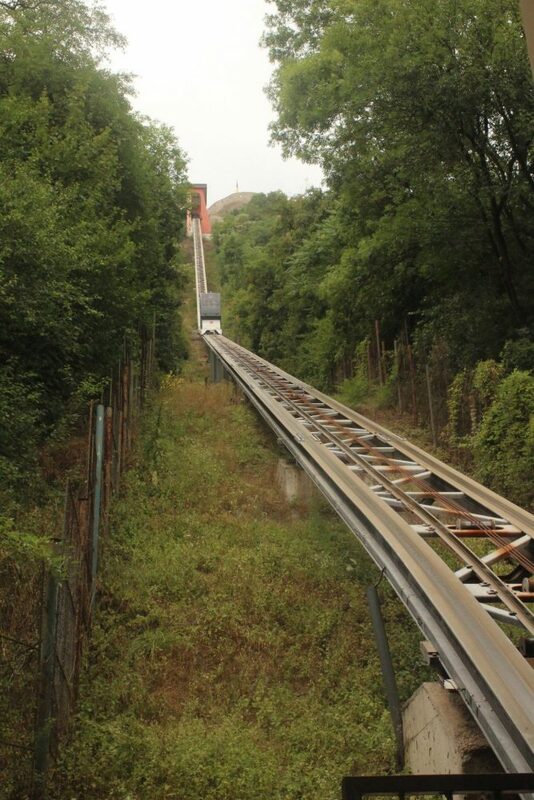 As soon as I caught a glimpse of the cable car and its track, I decided I’d take it up, but certainly not down. It was steep! And, about halfway up, it got steeper! I’m afraid of heights, by the way. Stepping into the cable car – warm and humid from all the people crammed in with us – seemed to be the signal for all hell to break loose in the sky, though I was too focused on my fear of the cable car to notice at first. The wind tore at the trees, increasing as we rose, quickly followed by pouring rain. By the time we arrived – I filmed part of the ascent on Facebook Live, narrating to deal with my fear – the wind was whipping the trees around, and I feared this boxy contraption we were in would blow off its track. My Facebook feed cut out before we reached the top, something that in my terrified state seemed an omen. My knees were shaking noticeably, and I swore to myself I was walking down, not stepping into this machine again. Finally arriving at the top – it had only been about a minute or two, but felt like much more – the door slid open. A man, clearly someone who worked there, leaned into the cabin, said something quickly in Romanian, and reached in to the controls to close the door. Apparently, he was sending us down again! Fortunately, I wasn’t the only one who disagreed. Other people began to push their way out. Realizing what was happening, so did I, and so did Albert, my husband. Stepping outside, I noticed several things at once. One was that the wind was much gustier up there. It was blowing hard and raining and … was that thunder? 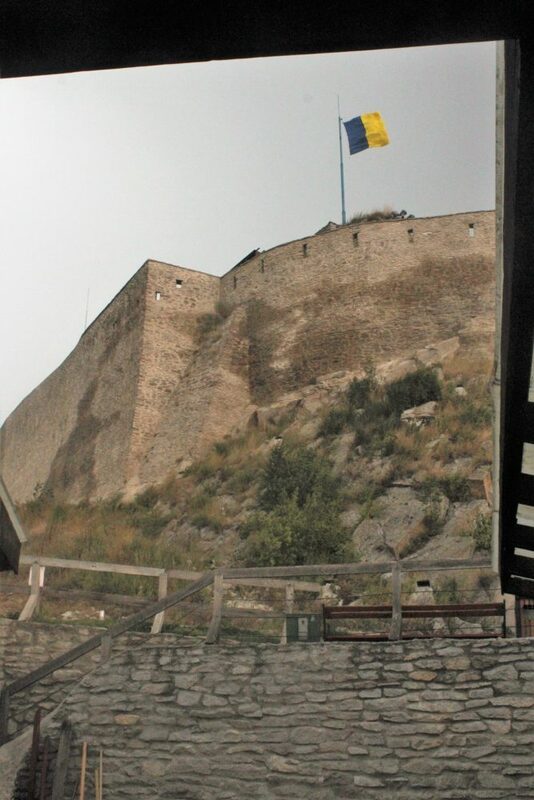 I could see and hear a flag up above us snapping loudly and a wide view of the town of Deva below us, clouds glowering above. A crowd of people were huddled under a very small roof over the entrance to the cable car. Clearly, they were trying to stay out of the rain and wanted to get onto the cable car as quickly as possible. Standing there under the roof for a moment, I realized that I was getting wet, since the wind was blowing the rain in our direction. There were just too many people there to be properly sheltered. Albert spotted another shelter below. It had a stone wall around it and wooden beams holding up plastic sheets as partial roofs. To my dismay, he made a dash for it. By this time, just during our moment of hesitation, it had become clear that those rumbling noises were thunder. Albert bent down low as he ran across the open space to the stairs leading to the other shelter. I held back, nervous about exposing myself to lightning. Albert has always been braver – or foolhardier – than I am. It didn’t take long for me to decide to follow him. The thunder seemed to be far away – I hadn’t seen any lightning – and it was pointless to stand here on the edge of this roofed space, where I was probably exposed anyway. So I made a dash for it too. The shelter I found myself in was edged in a horseshoe shape with wooden benches with roofs, clearly intended to shield people more from sun or wind than from rain. Nevertheless, the roof sheets were high above our heads, and the stone walls on three sides were only a bit shorter than I am. I felt safer there, standing close to the wall, knowing that any lightning was unlikely to hit me when the wall and the structure inside it were taller than I am. My view from where I sat on the ground between the stone wall and a wooden bench. 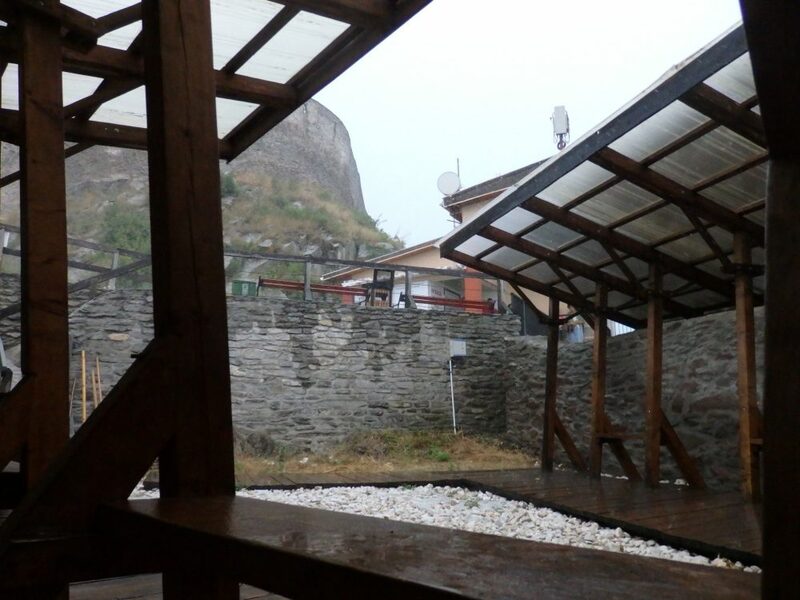 You can see the partial roof that covered the edges of the shelter, with a bit of the cable car station in the background, and the wall of Deva Castle above. Soon after I got to the shelter, the storm picked up in a big way: thunder and lightning and rain and wind as Albert and I, along with three other people, huddled there. Albert, standing in the “bottom” of the horseshoe, had the best view. He saw lightning bolts, as well as the flashes I saw. The wind was fierce, and we got pretty wet just from the rain blowing around. For a short while, the lightning and thunder were nearly simultaneous, meaning that the storm was right above us. I hunkered down on the floor of the shelter right next to the wall, figuring that the shorter I was the less likely I’d be to get hit by lightning. One woman, a Romanian, handed her phone to one of the others and posed in the center of the horseshoe for a selfie. Big smile, hand in the air with the castle up above her in the background … completely in the open and exposing herself to the lightning! Oh, but wait, that wasn’t good enough. Take another please! And she posed again. Returning to the relative safety of the stone wall side, she then began to pray, posed with her hands clasped at her mouth, eyes closed, lips moving. It seemed to me that she really should have prayed before her selfie, not after! Though I suppose she could have been giving thanks. I felt wet and uncomfortable, but relatively safe. The question was: what should we do next? Wait out the storm? How long would it last? I had sworn to myself not fifteen minutes before that I would not go down in that cable car. And anyway, could that possibly be safe in such high winds, with lightning striking around us? Yet gradually the people huddled under the cable car station’s roof above us were indeed filling up the cable car and descending. Eventually, the man in charge signaled to us. He shouted down to us, and one of the other tourists translated for us. A discussion ensued among the five of us. Would the storm pass soon? The consensus seemed to be that it wouldn’t. We couldn’t go up and see the castle as long as the storm lasted. In this? Are you crazy? So we went. Again, bent over low, praying that the lightning wouldn’t strike, we ran as fast as we dared up the wooden stairs from the shelter (one was loose) and to the small space under the cable car station’s roof. Did we have a choice? Wait out the storm. One of the Romanians checked a local weather app, which showed that it was expected to last for hours. Walk down. Dangerous and probably very stupid. Take the cable car down and hope there was no outage. This whole discussion took place standing against a wall, under the eaves of the cable car station, shouting to be heard over the rain and wind. It was letting up, though. And I noted that there was a longer pause now between lightning and thunder. In the meantime, a few more people had appeared from up the hill. I think they’d been holed up somewhere above in the castle itself and, hearing that the storm was subsiding, had decided to make a break for the cable car. Deva Castle, as seen from where Albert stood under the shelter. It’s the closest we got to it. Photo courtesy of Albert Smith. So we took the cable car down. I didn’t see much, spending the whole ride with my face buried in Albert’s shoulder. The ride was uneventful. Probably the most dangerous moment, though, was at the bottom. Stepping out of the cable car, we realized something we hadn’t thought of before. Our car waited in the parking lot: a big, flat parking lot, with no trees, no walls, no shelter. Bending over, running, we made a dash for the car. It was rainy and windy still, but fortunately the thunder had subsided to just a low rumble in the distance. So this is why I didn’t see Deva Castle. Unless you count the distant sight of a stone wall, with a flapping, snapping flag rising above it. What a crazy adventure, Rachel! Glad you made it down the hill safely, but sorry you didn’t really have the chance to explore deva Castle. And since Deva Castle is pretty much just a ruin, I doubt I would have anything to write about it! Glad you liked it! I love watching lightning from inside a safe, comfortable, dry place. This wasn’t any of those things. But you’re right: mishaps make for good stories afterwards! Sometimes you get what you need. You’ll have to revisit someday to get what you want. Great story! As I started reading your article I thought “oh, the joys of taking a detour!” Then the storm hit…I am just glad you made it safe and sound, but I did chuckle a few times at your narrative. Great post!! Oh my! What an unexpected adventure. I probably would have detoured too with such an intriguing description. Too bad you didn’t get to see the inside of the castle. We also had our weekend plans disrupted by lightening. I had taken my Girl Scout troop to do a high ropes course, but they heard thunder just as we were about to put on harnesses. No hanging off of a tall metal tower for us. The girls were very disappointed. I bet they were, but you can’t take risks like that! We heard and read about Corvin but decided not to go because it sounded like it wasn’t restored authentically, i.e. is was made to look more like the 19th century restorers thought a medieval castle should look like. Your post, though, makes me regret not going there!